Today wasn’t anything special. With the snow storm well under way there was only one thing that needed to be done. That is we needed more wood to get us through the winter. Normally by this time of year we are in the warmer days and not using wood except at night. This year has been a bit different though. From the time I can remember we have never had snow this time of the year. After this next week it is suppose to start warming up but that doesn’t help us keep warm now. Anyway, Dad and I went and cut about 2 rick of wood and got it home, unloaded and split so that we can use it. In the cold and with all the breaks to warm up, it kept us busy all day. Well, except for the time it took Mom and I to podcast that is. Today was a long day of doing nothing. It started out productive enough. I did chores and the normal everyday things I have to do around here. Then Mom and I headed to do one thing and it took over 5 hours. It might not have taken so long but we had an hour of drive time each way. Want to know where we went?? Well, to get me some new wheels. Nope, not a car or a truck … Just some wheels. They were for the Truck actually. And Yes I paid for the entire set of 4 tires for the truck. You see it all started when Dad and I got a flat on the truck a month or so back on the way to a rodeo. At that point Mom said it was getting to be time to put a new set on and that come tax time if she got a refund at all that is what she would do. Well, I started keeping track of Mom’s use of her truck over the last month and I figured out one thing. Mom only drives her truck for me. She does go to town once every two weeks for the household things but she stops and gets a ton of feed when she does so those trips are kind of for me and my animals as well. From that thought to thoughts of what other 17 year olds have to pay to have a vehicle I figures out that I don’t pay gas or insurance for this truck either. I have to admit it is nice to have a medical reason to not have to have the expense of a truck and still get where I am going and to do the things I want but that doesn’t mean I shouldn’t do anything. So I saved my Rodeo winning for the last month and a half and today I took Mom and the truck to get a set of 4 new tires. Then I figured out that since I got 50,000 mile tires that it would take over 3 years to put that many miles on Mom’s truck. LOL By then I will be 20 years old and should have my license and hopefully my own truck. Anyway, we had to wait for almost 3 hours for the truck to get done. Then on our hour drive home it started to snow. We stopped at Sam’s and the feed store before coming on home. We got home about 4 and started unloading the feed. After that Dad got home, we did chores and ended our day watching it snow …. Today I only had one thing that I had to get done and it had to be done at 3:00pm. That means I had time to do chores and take it as a bit of an easy day. I did a bit of school work, some indoor roping with my little buddy and even some outdoor roping with Joe having his fun time. I took the time to weigh Patch and Penny about 1pm. Penny has gained about 9 oz. but Patch has only gained 3. That means that we will weigh them again this evening and if Patch hasn’t gained at least 6 oz. since yesterday Mom says she will be getting a bottle supplement. I will have to milk Fudgie so that Patch will have the right smelling poop but it will be worth it. One of the things Mom and I did in our “spare” time today was we worked on the stalls and window “words” from the kickstarter. Check this out!!! They weren’t quite dry when I took that picture but they look great. Mom called it an old fashion art project. What ever It is I like it. 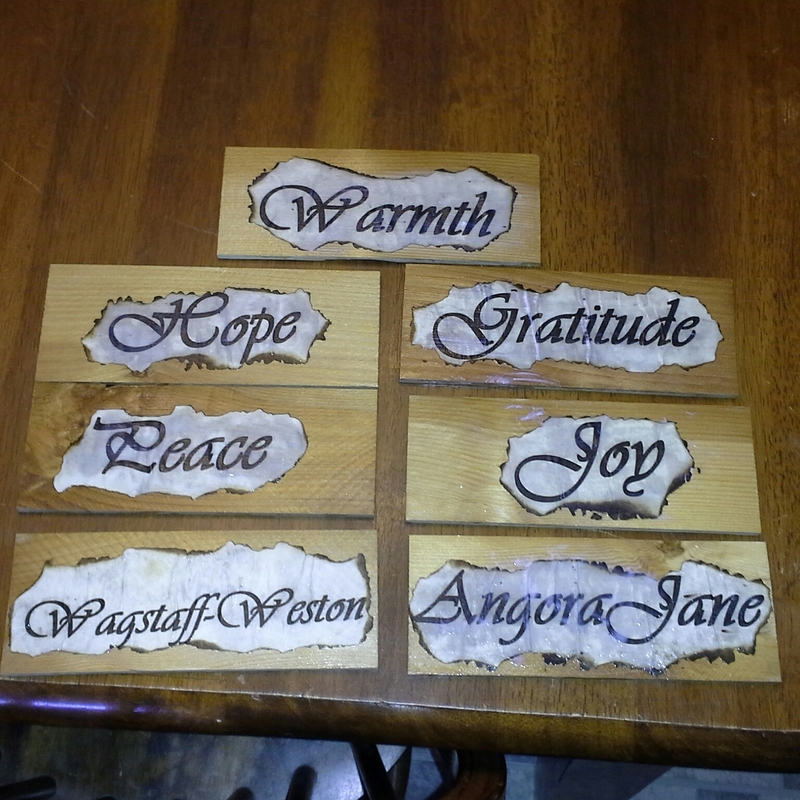 We tried several ways of making the plaques before we settled on this one. I love it and I think it will keep with the rustic look of the barn. And got it stored away for future use. When we got home Mom had made a large Tater-Tot casserole and I made sure to eat my fill. The next few days are suppose to be a bit colder so I will be keeping an eye on the sheep and make sure to keep any new little one warm. Tomorrow if all goes right we will get the new tires on the truck and a load of feed brought home. Today it was actually pretty nice. By nice I mean above freezing with no wind. I got the chores done and checked in on our two newest little ones. Both Penny and Patch seem to be doing fine. However, as the day progressed no matter how many times I checked on them, I couldn’t seem to catch them nursing. So in a final act of desperation to make sure they are getting everything they need I tried to get them to latch on while Dad held Fudgie. They both only took about 2 slurps and then wandered off. This leads me to believe they are nursing but that I am just not seeing it. Mom’s solution to the problem is to put them on a weigh-in schedule. That means twice a day – morning and night – we will be weighing the little boogers. As of tonight, Patch weighed in at 9 lb 11 oz and Penny weighed in at 9 lb 15 oz. Tomorrow if we don’t see at least a weight gain in a few oz. in each lamb we will put them both on a bottle supplement. I plan to milk Fudgie and make sure they both get their Momma’s milk if I need to supplement. The rest of my time was spent getting a couple of things done. 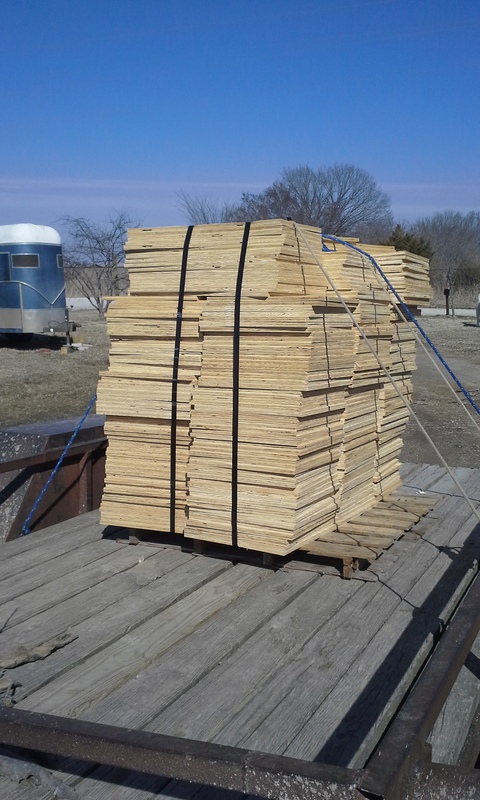 First, Mom and I picked up a large load of donated wood for bird, bat and butterfly houses for the 4-H kids. Then I spent a few hours in the roping arena. Finally, I went to art club. And one last thing … I had a deal with the sheep that they all should wait until Wednesday (the nicest day of the week) and I have to say not ONE of those EWES kept our deal!!!!! Today wasn’t going to be much of an exciting day I didn’t think. It was still cold but not as cold as it had been. Mom and I were a bit late getting up but the day gave way to it’s normal start of chores, cleaning up the house, cookie baking and Dishes. My days start the same no matter what time I start them. After those normal things School is in short order. By the time Dad calls on his lunch hour I am starting my lunch as well. After lunch when the weather allows I take care of my PE class. For those of you that don’t know PE class and Roping are one and the same. Today however, that is were the normal ended. You see in the middle of PE class Dad came home and while cutting across the pasture found that Fudgie had just given birth to twin girls. 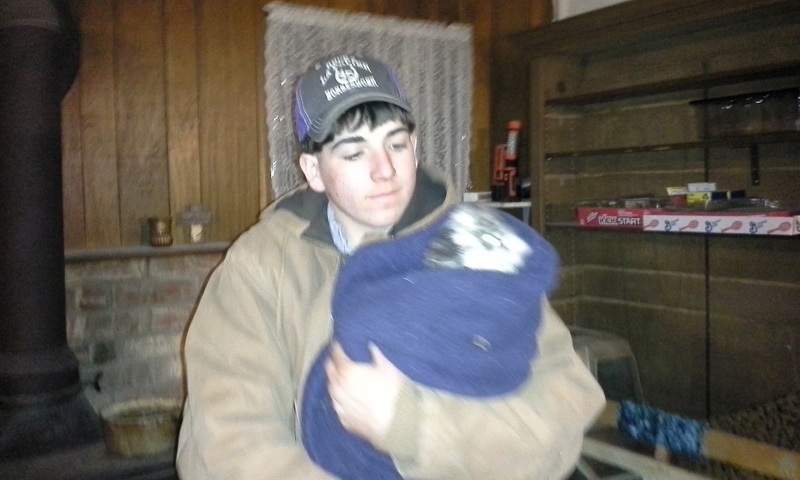 I got the two babies wrapped in a blanket and handed them off to Dad. Then I got ahold of Fudgie and we all moved slowly into the new barn where I had the birthing pens set up. Dad and I worked fast to get them both dried off as the wind was a bit on the cool side today. Dad still doesn’t have the whole drying thing down yet to I had to jump in and get the littlest one going. 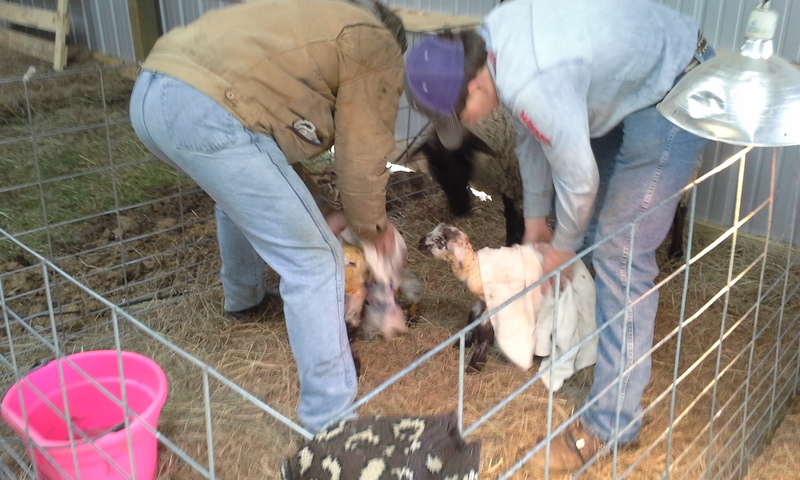 After we dried them as best we could I headed for the jackets while Momma and babies got to know each other. 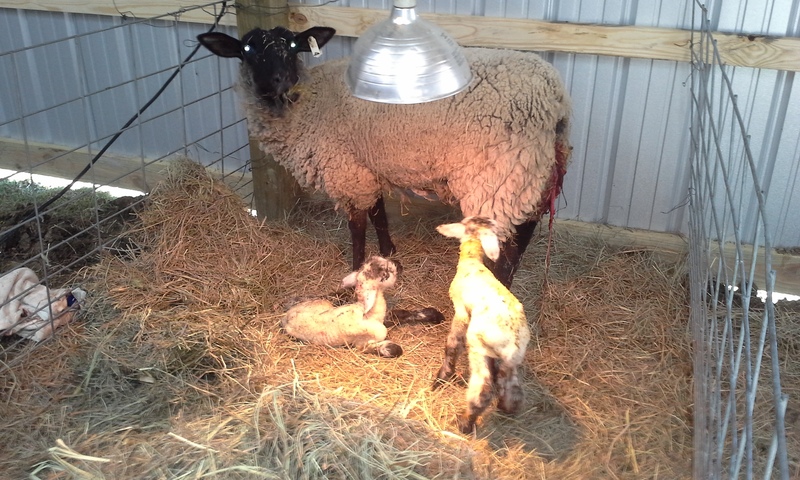 After that I left the little ones to figure out their world and get in a bit of nursing. By chore time I came back to feed and water both Reba and Fudgie only to find the littlest lamb unable to stand. I tried to help her out by holding her up but had no luck. I got Mom to the barn and she scooped the little one up and headed for the house. I stayed behind to “milk” out some colostrum from Fudgie. 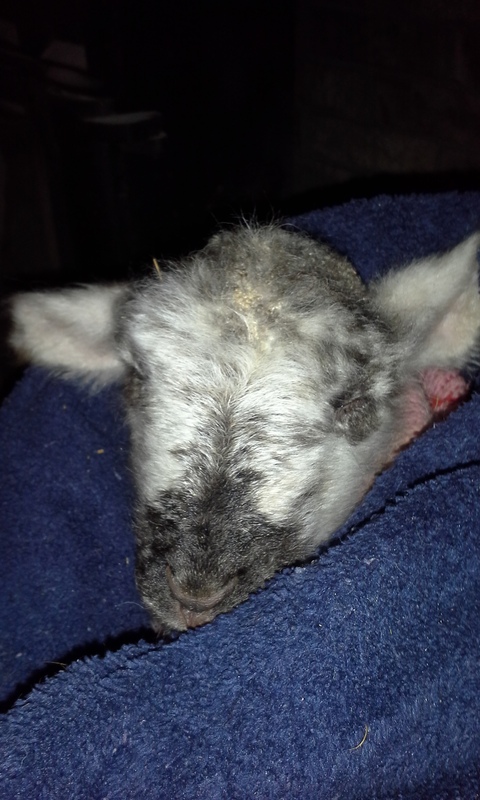 The little lamb was cold and while I milked Mom got her in the house, wrapped with a blanket and getting warmed up. When I got inside with the colostrum Mom and I traded jobs. 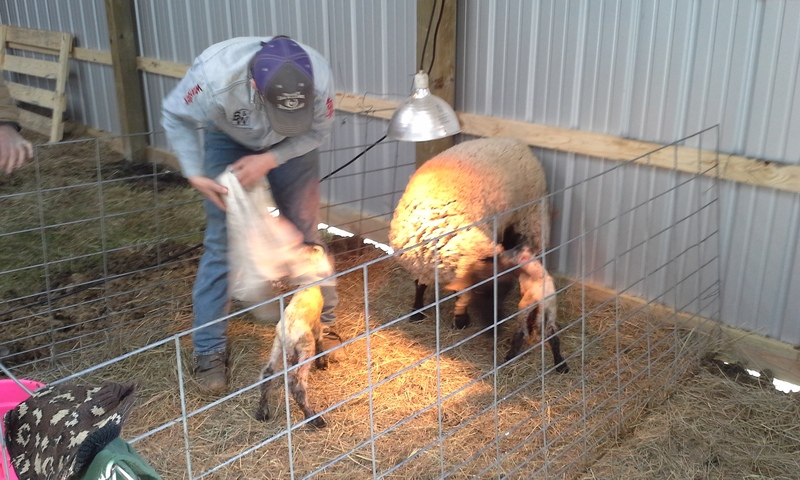 I got to hold and rub the lamb all over, while Mom warmed the colostrum up and prepared to “feed” the little thing her much needed nutrition. 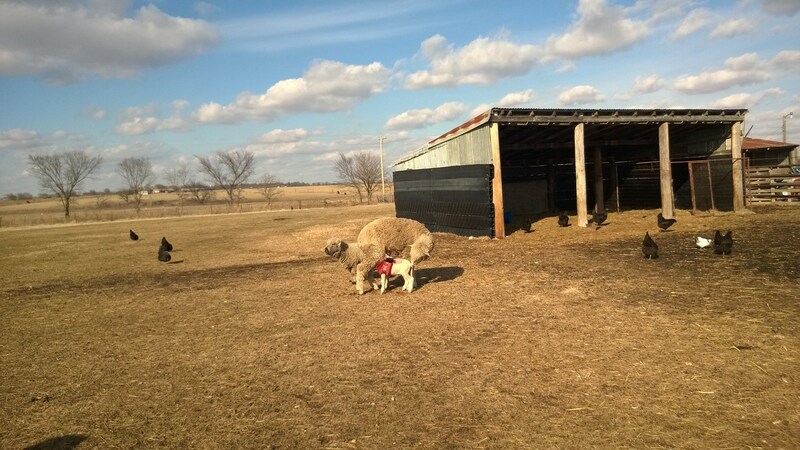 With a syringe of warm colostrum Mom made baby talk and got the little one taking the colostrum. Mom worked and got about 36cc down her before we saw some real improvement in her. 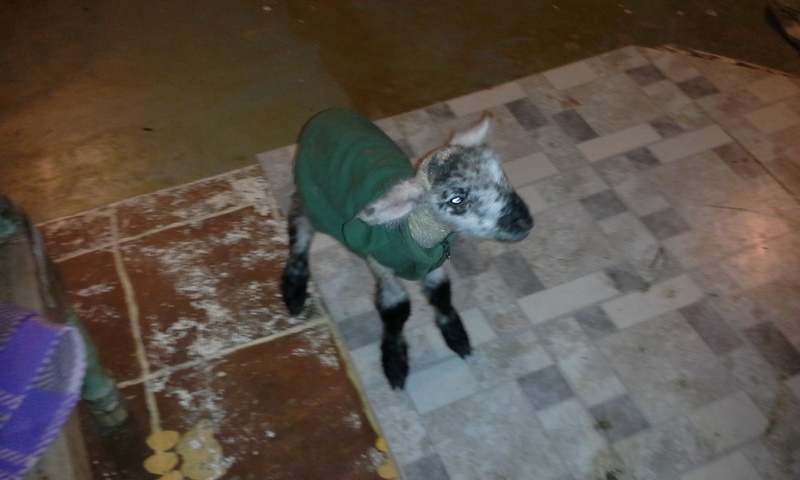 By the time we got her warm and fed we had her standing on her own as well. 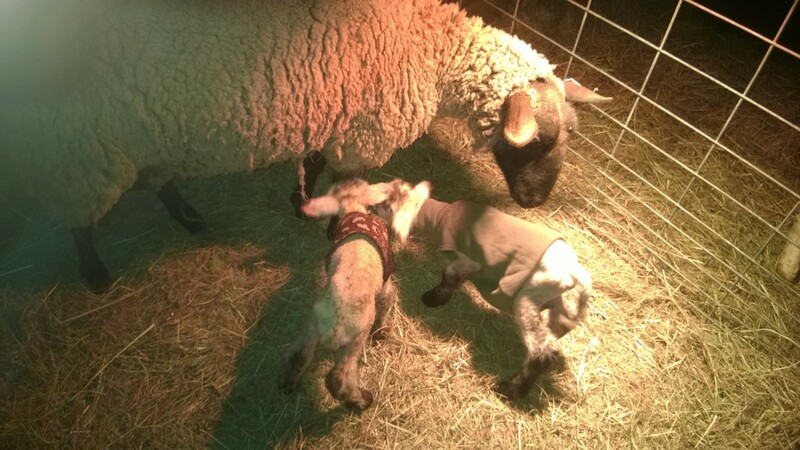 I returned her to her Mom shortly after we got her acting “lamb like” I spend the evening checking on her and I will be getting up early to check her many time threw the night to make sure she is doing okay. Thanks to a Facebook post and Ms. Mary we now have names of Penny and Patch from 101 Dalmations. The one that had to be warmed is Patch and her jacket is green. Penny has on a Brown Sweater. As for the chicks they are doing fine It seems we have lost the ones that got here in distress but for the most part the ones that made it through are doing really well. All day yesterday I was at a very long roping. It was a 3 head with a short go. That means I had to rope 3 claves and if I made it in the top 4 I would get one more run to see who the winner was. I ended up third over all so I am good with that. On the way home Dad and I stopped to pick up some dog food and a few things we needed to get through the next round of ice and snow. I got home late, did chores, ate a wonderful dinner of hamburger soup and homemade bread and then headed off to bed. 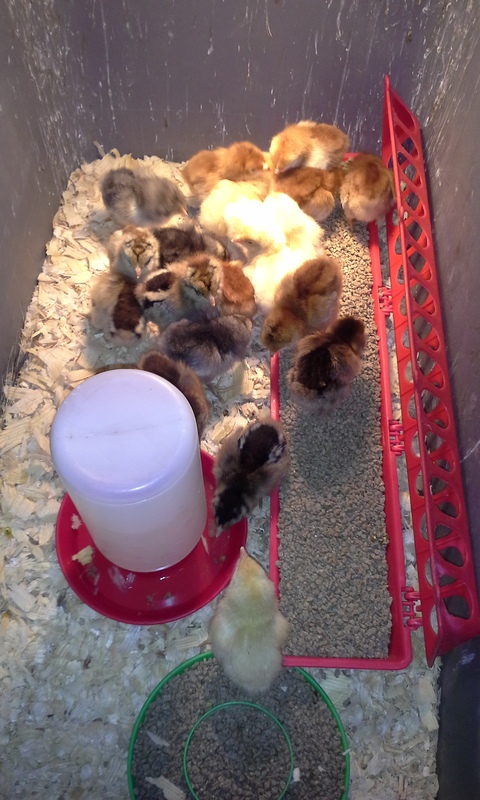 This morning, the chicks finally arrived. Mom got the call at 8:30am and we headed right to the post office. Mom and I have been very concerned as our cold snap hit just after our fine feathered friends took to the skies to get here. When they arrived this is what they looked like! When we got to the post office, Mom opened the shipper to see one chick had passed and three in a sever state of distress. The post master put them in the post office bathroom in front of the wall heater to get them good and warm before heading out into the cold to get them home. While they warmed I mailed all the rewards for the Kickstarter. After the box warmed up and we saw more movement and heard more Peeps among the chicks, and when I got done mailing everything out, Mom and I jumped in the warmed up truck to get them home as fast as we could. Since the cold snap Mom and I decided it was best to have the little ones inside. With the shipment being late I think it is best to keep them out of the cold too. We set up the tubs with waters, feeders and heat lamps before the call came in so we were all ready when we got home. Once we got them to the bathroom and in their tubs, Mom treated the worst of them with a drop of honey on their beak but she also had me put a few teaspoons of sugar in both of their waterers. 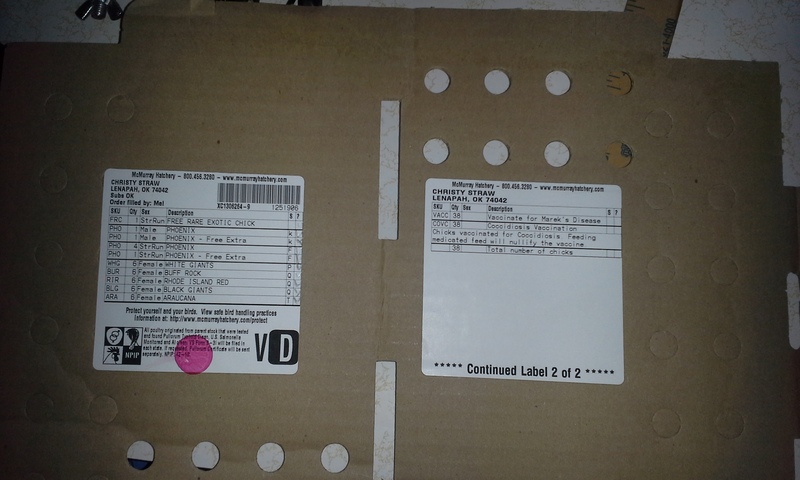 If you can see on the inside of the lid is a inventory of the chicks included. There isn’t just one free chick in the box. 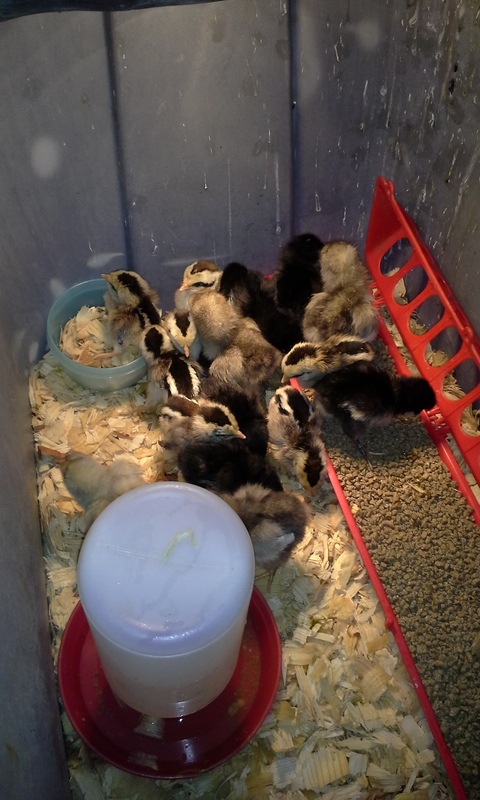 Mom was super excited to find that they also included two free Phoenix chicks as well. You see they are the ones Mom got for her Birthday. That means she got 7 baby Phoenix chicks!! Now if they will all make it we will be very happy. We won’t know how things will turn out until tomorrow morning. So while Mom did chick checks I spent the rest of my day doing sheep checks. I have tried to make a deal with the sheep, they are to hold off giving birth until Wednesday and I will provide them with extra animal crackers. I just hope they keep up their end of the bargain. In between checks I took time to rope the dumbie a bit but it was really to cold for much of anything else. Okay, so I need to tell you that I didn’t blog yesterday due to the fact that I had a headache. I worked part of the day for a Friend Moving some hay but that has nothing to do with anything. I roped that morning and was fine then too. However, when the sun set in the West … My head was throbbing. Good thing I didn’t have a lot going on last night. There is one thing I wanted to show you and that is what Mom bought Dad for an early anniversary gift. Check this out. It is an aerial shot of our farm. We have been able to pick them up cheap a couple of times before. 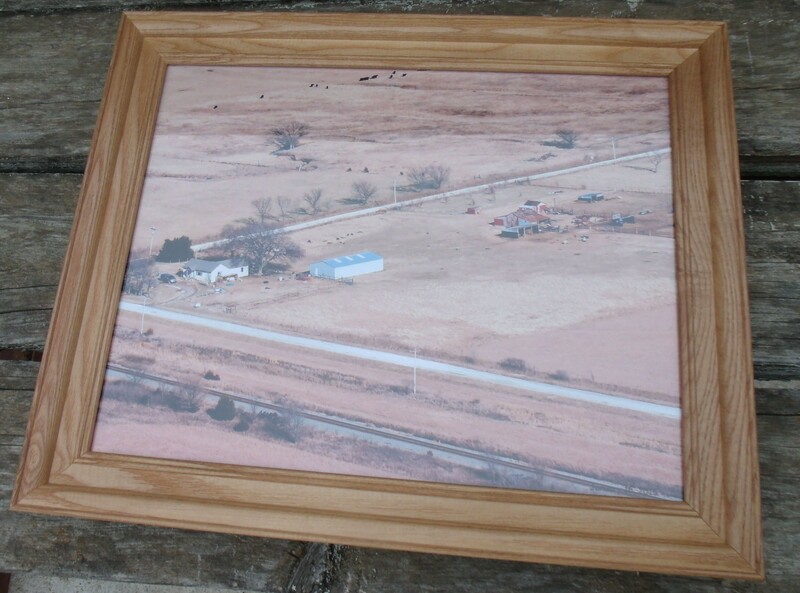 This new picture has the new barn in it and that is the only reason Mom got it. It is cool to look at the old one from when we only lived her a couple of months and see all the changes. Anyway, today I did get a few things done around here. After Dad and I got a bit of wood cut so that we can stay warm Monday in the next round of snow, I got the two calves I needed Banded done. 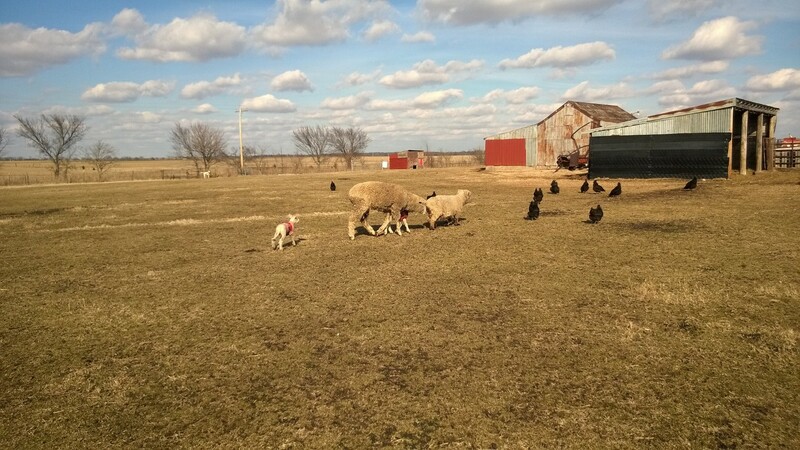 After the work was done I did a bit of roping but not until I got the little lambs turned out to play. 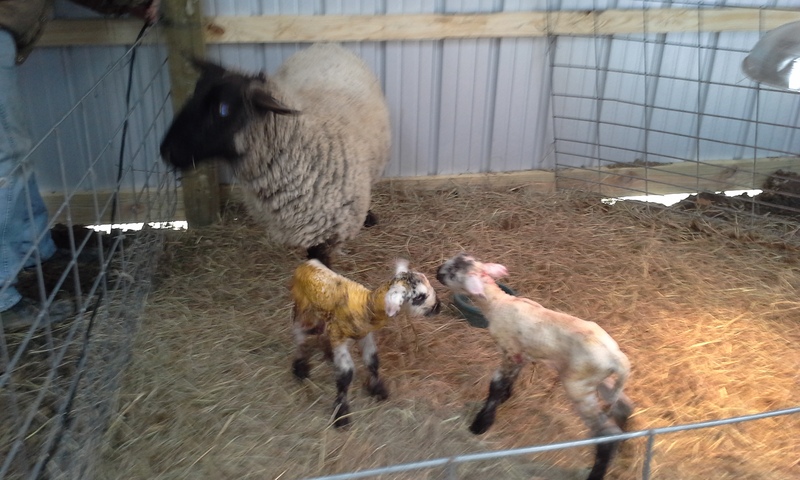 They are both doing so well but while Mom and I kept an eye on them in the pasture we took time to do a whoha check. Next to go it looks as if Snickers, Fudgie and Twix are all right there and can drop us some babies at any time … So let’s all pray it isn’t in the snow that is suppose to happen this next week! As for now I am headed to a goat roping. I will let you know how I do tomorrow!